She was a homemaker and of the Baptist faith. She was a poised, gracious woman who intellect matched her great beauty. She was valedictorian of the Russell Springs High School class of 1949. She was the matriarch of a wonderful Russell County, KY, family. She was the daughter of the late Oris & Agnes Smith Beane, and the widow of Carlie Earl Smith, her husband of over 55 years. She leaves 16 direct living descendants. Her final resting place will be in Russell Springs, KY.
Marlene Jeanette Beane Smith, 86, of Russell Springs, KY, daughter of the late Oris & Agnes Smith Beane, was born on Friday, December 25, 1931 at Webbs Cross Roads in Russell County, KY and departed this life on Saturday, March 10, 2018 in Elizabethtown, Hardin County, KY at the age of 86 years, 2 months, and 16 days. She united in marriage to Carlie Earl Smith on October 22, 1949, he preceded her in death on July 31, 2005. 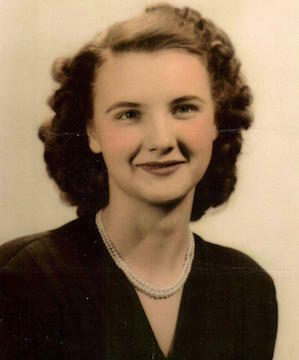 She graduated from Russell County High School and was the Valedictorian of the class of 1949. In keeping with the family's request, her body was donated for medical research in the fight against Alzheimer's disease. Arrangements were facilitated by Medcure. Upon completion of her contribution, she will be cremated and her remains will be interred in the Russell Springs City Cemetery next to her beloved husband and daughter. There will be no visitation or other formal funeral services, with a graveside memorial service to be held at a later date. Mrs. Smith was also preceded in death by a daughter, Rhonda Kay Smith Kuschmierz, in 1991; her life-long best friend Mrs. Vatis Kinnett (Orby) Foley in 2009, and a brother-in-law Urias "Deedle" Stephens Jr. in 2014. The family extends thanks to the wonderful staff at Bluegrass Assisted Living, MD2U, VNA, Hosparus of Central KY, and others too numerous to mention for the care of Mrs. Smith during her extended illness. Memorial contributions are suggested to Hosparus Health of Central Kentucky or the Alzheimer's Foundation of America. 2018-03-12 - Russell Springs, KY - Photo photo courtesy of Smith family.